aardvark.dj: Into the top 100! I'm the king of the castle! You're the dirty rascal! There's a voice at the back of my head saying something aobut treating those as you go up and coming down again. But sod that. Bow down before your mighty champion you not-so-popular bloggers. I rule! Update: Up to 96 on 16 November! Eat my dust! Thanks for dropping by my site and leaving a comment. 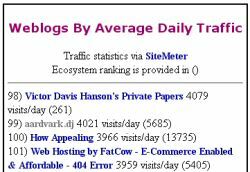 I see that Blogexplosion is working for you as well fairly well. Long Live blog Explosion. I have added you to my favorites.